Phillipson, Donald J.c.. "Charles Camsell". The Canadian Encyclopedia, 05 November 2014, Historica Canada. 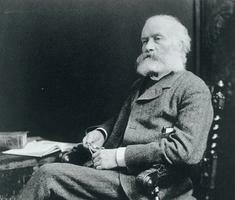 https://www.thecanadianencyclopedia.ca/en/article/charles-camsell. Accessed 18 April 2019. Charles Camsell, mining engineer (b at Ft Liard, NWT 8 Feb 1876; d at Ottawa 19 Dec 1958). Son of a Hudson's Bay Co factor, Camsell was appointed geologist with the Geological Survey in 1904, became chief exploration geologist in 1914 and deputy minister of mines in 1920, a post he held until retirement in 1946. Author of many geological papers, Camsell was possibly more important as an organizer, leading his department's methods from the canoe to the aeroplane, initiating laboratory research to complement field exploration, broadening its functions to include publishing and the National Museum (including native anthropology and its fossil collections, notably of dinosaurs) and keeping its old esprit de corps alive through the hard times of the Depression. He became a fellow of the Royal Society of Canada, was a member of the NATIONAL RESEARCH COUNCIL 1921-36 and in 1944 with C.J. MACKENZIE reorganized postwar government science. The Charles Camsell General Hospital in Edmonton is named in his honour. C. Camsell, Son of the North(1954).